He won’t be 21 until July, but Seattle-grown DeAndre Yedlin made the U.S. World Cup team with Clint Dempsey, but Sounders teammate Brad Evans was passed over. DeAndre Yedlin, a 20-year-old defender for the Seattle Sounders, was among 23 players selected Thursday by head coach Jurgin Klinsmann to represent the U.S. in the World Cup in Brazil June 12-July 13. Yedlin, a surprise pick, is joined on the roster by Seattle midfielder Clint Dempsey, long designated the USA captain. Seattle defender Brad Evans, who had numerous USMNT appearances over the past year, was not among the 23 players selected by Klinsmann. Nor was L.A. Galaxy great Landon Donovan, one of the outstanding players in U.S. soccer history. “It’s an exciting moment when you have narrowed the roster down as a coaching staff, and these 23 players that you’ve chosen can focus now purely on Brazil,” Klinsmann said in a news release. 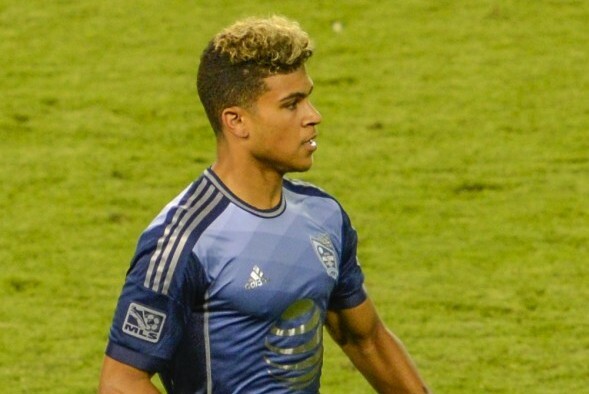 Yedlin was named a 2013 MLS All Star and finalist for the 2013 MLS Rookie of the Year award. He was the first homegrown player signed by the Sounders after playing for the Sounders FC Academy. He was a two-time All-MAC First Team honoree at the University of Akron. In 2013, led the Sounders with 2,710 minutes and ranked second with 31 appearances. Led Sounders FC last season with 37 appearances, 35 starts, and 3,124 minutes across all competitions. Yedlin appeared in 11 games, all starts, for the Sounders this season before he joined the men’s national team for World Cup training camp. He played 960 minutes. Yedlin’s speed is seen as the biggest assets he brings the U.S. against some of the world’s fastest players. Yedlin makes his first World Cup appearance after earning his first two caps earlier this year against Korea and Mexico. The Seattle native represented the U.S. at the 2013 FIFA U-20 World Cup in Turkey. Evans will remain on a standby list but is expected to rejoin the Sounders soon, possibly in time for Seattle’s game against the Vancouver Whitecaps Saturday afternoon. USMNT will play three matches in its Send-Off Series from May 27-June 7 in San Francisco, New York and Jacksonville, FL. Seems to me this roster is intended to give younger players the experience that they’ll need in future international matches. This team would have been a surprise if they went deep in the tournament even with experienced players like Donovan and Evans. I think this is good for Yedlin in that case. He should get some playing time. Alas, where have you gone Freddy Adu? Last I heard, Adu was in Brazil’s second division. Re: Yedlin, his speed and offensive skills could be a surprise weapon off the bench, but he still needs much work on his defensive game. He got torched against New England a couple of games ago, and he had a few other subpar games where he got caught forward and Traore, Marshall and even Alonso had to cover for him. I agree Yedlin needs work but that’s why he’s here. This team is more to prepare for 2018 than it is for a deep run in the WC. I think Yedlin’s selection is only a surprise to those who haven’t been watching him play. For one so young, he’s been pretty consistent in MLS and, as mentioned, his speed will really be an asset in Brazil. I’d have liked to see Lamar Neagle get a shot. He’s really blossomed the past two seasons. Good to see Wondo on the roster, too. He’s a pain in the backside to opponents and their fans (hockey people call guys like him a “s–t disturber”), but you can’t say he’s ineffective.